We’d love your help. Let us know what’s wrong with this preview of The Doppelgänger by Ruchira Khanna. To ask other readers questions about The Doppelgänger, please sign up. First things first, when I see this attractive cover it gives me the hues of soft story. I thought it would be like two long forgotten souls yearn to bond. But to me, it was actually quite witty, to begin with. So the story sets in Santa Barbara, a small town of California. Sandra lives with her son Liam. And Liam has this first play date with his friend. He shares his little secret of visiting the other world and goes on an expedition to the other along with Boyd. There he learns of the doppelg First things first, when I see this attractive cover it gives me the hues of soft story. I thought it would be like two long forgotten souls yearn to bond. But to me, it was actually quite witty, to begin with. So the story sets in Santa Barbara, a small town of California. Sandra lives with her son Liam. And Liam has this first play date with his friend. He shares his little secret of visiting the other world and goes on an expedition to the other along with Boyd. There he learns of the doppelganger of his late dad and all. Sandra finds herself enters into the same. The story gears up how Liam, Boyd and Sandra learn about Liam dad’s look-alike. To know more about whether did they return to the real world or did they gain something there? go and check this out. I love how the author has given the splendid stroke of subtle humour in this story. And this page-turner is for everyone who wants a simple fancy storyline with no hurry burry’s. The way the author narrates the story is like a smooth ride to our imaginary world. The mysterious hand in the cover exactly conveys the story. So, all in all, I love it whole given how it was told carrying visuals with all emotions and joy of another world. Absolutely recommends this. This is the first book of this author that I have read and it was a pleasant, fast-paced read. I liked the paranormal/fantasy angle that gives a different view of life and death, and our beliefs about what lies on the other side. It was interesting to see a colour-inverted 'after life' or a parallel universe that is distinctly different from what is commonly known as 'Heaven' in many religions. The metaphorical aspect of the story was very well put...that we must let go of our ego to find peace. This is the first book of this author that I have read and it was a pleasant, fast-paced read. I liked the paranormal/fantasy angle that gives a different view of life and death, and our beliefs about what lies on the other side. It was interesting to see a colour-inverted 'after life' or a parallel universe that is distinctly different from what is commonly known as 'Heaven' in many religions. The metaphorical aspect of the story was very well put...that we must let go of our ego to find peace. Sandra's act of revenge on her pet and Sam's inability to let go of his worldly desires even after death have a negative effect on all the characters in the story, leading it all to a dramatic end. At first, I thought it was the way a young boy was dealing with his father's d I have not read many metaphysical books and this concept is very new to me. So I read this book without many expectations. The story of life and after live women into reality is very well written. Ruchira Khanna's books always hold a tinge of philosophy which I rather like. This book too is not a very easy read and it took me some time to get into it but when I did I found myself fantasizing about my own Doppelganger. The Doppelganger is a short story with a unique combination of two genres: fantasy and paranormal. It is a little different genre but really worth a read. Usually, life after losing a loved one is difficult especially, when the loved one leaves the world all of a sudden and at a very young age. For Sandra, it was difficult to cope after losing her husband but when she, by chance meets Sam's doppelganger Fran everything changes. I loved the unique theme of the story. It is a good, short read with a The Doppelganger is a short story with a unique combination of two genres: fantasy and paranormal. It is a little different genre but really worth a read. I loved the unique theme of the story. It is a good, short read with a unique story plot which has never been explored before. The Doppelganger is definitely a must read by everyone, if you wanna read something different yet interesting. I went into this story without reading the blurb, but the cover of the book was kind of depicting a love story but it surprised me with the genre. The story starts and continues at a good pace with no slack or dip in the narration. The concept of the thing that all of us having doppelganger is used real well. The story is unlike anything I have read...it does keep you hooked with relatable characters suffering the emotion of loss and love. Pick this book up if you like to read something magical I went into this story without reading the blurb, but the cover of the book was kind of depicting a love story but it surprised me with the genre. Pick this book up if you like to read something magical or unbelievable. A good quick read with unexpected twists. A very different take to death and love. The fantacy interlaced adds to its charm. What a great story that makes the reader think about life, death and beyond. The author has crafted a story with memorable characters and deep insights. A great read. Life doesn't end after losing a loved one. It goes on with new expectations and challenges. Ruchira's new book explores life on the other side. Will it be the same or will it be different. Her new short story is a thriller with a twist. Perhaps It’s The Unique Plot Or The Sheer Intensity That Comes Across From The Author RUCHIRA KHANNA And Immediately Connects With The Reader That Makes ‘The Doppelgänger Such A Captivating Read That Is As Thought Provoking After The Read As It Is Amusing While It Unravels. Even Though This Happens To Be Fiction At It’s Best Yet One Cannot Help But Wonder ‘What If This Was To Really Come True And Death Was No Longer The End But Just A Crossover Into Another Dimension Where One Could Possibly Be I Perhaps It’s The Unique Plot Or The Sheer Intensity That Comes Across From The Author RUCHIRA KHANNA And Immediately Connects With The Reader That Makes ‘The Doppelgänger Such A Captivating Read That Is As Thought Provoking After The Read As It Is Amusing While It Unravels. Even Though This Happens To Be Fiction At It’s Best Yet One Cannot Help But Wonder ‘What If This Was To Really Come True And Death Was No Longer The End But Just A Crossover Into Another Dimension Where One Could Possibly Be Interconnected? The Premise Itself Is Captivating As It Is Amusing But In The End It Is The Unique Presentation By Ruchira Khanna That Lingers On With The Reader Long After The Curtain Has Come Down On This Short Tale That Is Just 34 Pages Between The Covers But It’s The Content That Is Successfully Packaged Into The Pages That Is Indeed Impressive. The Plot Is All About A Child Liam And His Mother Sandra Who Are Grieving In Their Loss As They Cannot Get Over The Death Of Those They Loved And Now Miss. It Is This Deep Connection That Opens A Tunnel That Leaves Both Of Them Stunned And Offers A Ray Of Hope When The Boy Connects With His Favourite Deceased Pet Doppelgänger That Leads On A Fantasy Trip But How Long Shall It Be Before The Bubble Bursts Or Can They Actually Time Travel To Unite & Live Happily Ever All Again Beyond Life & Death? 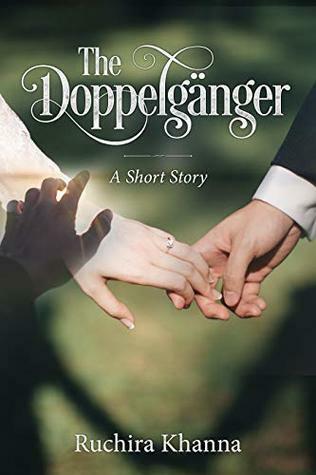 Sandra and Fran’s story is tha Backed by an interesting plot and an evocative cover design, The Doppelgänger is a metaphysical short read that takes the reader into the heart of a realm entirely different from the real world that we humans are used to. What plays out is something that the rationale side of the human mind may find difficult to accept. However, look at the story from another angle that of human aspirations and emotions, and feel a tug at your heart. It’s now easy to relate with it. A story with a mix of suspense, subtle humour and the paranormal, The Doppelgänger sees the presence of characters that are well articulated. Yes while the human side is relatable, the ones from the other side come across as unbelievable. Yet the emotions they express, speak volumes of the feelings that the mute in this world of ours may be experiencing. This book is a multi genre one. A small 35 pages book and I read it in one shot. The Doppelganger by Ruchira Khanna is a story which takes place on many planes/dimensions. Metaphysical Romance with a twist. I liked that the author showed that life is never easy. The story showed both sides of the situation.The language is super simple. The story flows consistently. The story got me thinking of the various possibilities. It is spiritual + scientific. You will have to read it to believe it. I dont want to give out spoilers. Leave your brain aside and read till the end. It will leave you gasping in surprise. There are few characters in the book. I liked how the innocence of children is used as a motive to carry the story forward. I would have liked if the mother character was a little stronger. The idea of the story intrigued me as did the name. And a combination of the astral world with lookalike souls does make for an interesting plot. Having said that, the genre itself requires careful handling and needs to be supported by clear language. Unfortunately, the language is vague and one is left confused. The loss of a loved one is unbearable and everything comes to a standstill if the reins of one’s life is not picked up to move on. Let me start with the title of the book. Doppelganger as the title reads hints the reader that it is something connected to the parallel universe. The cover of the book is aptly designed to suit the name and plot. The narration is good and medium paced. Characterization is well justified. Language is crisp and lucid. Adopting a paranormal concept and usi The loss of a loved one is unbearable and everything comes to a standstill if the reins of one’s life is not picked up to move on. Emotional breakdown that comes with the loss of a loved one has been depicted well. It was difficult for me to accept certain things like talking animals, and I felt that the book was targeted for the younger audience viz kids. This book can be picked up as a onetime short read where you don’t expect anything.